The Tech Works CC-RS-4 is a 4 light/4 button Intelligent Room Status Station. 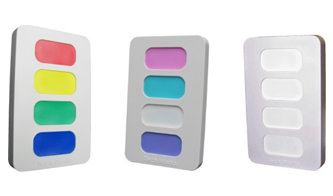 The four lights/buttons are available in 3 color options “B” for Bright colors, “N” for No colors (plane white), or “P” for Pastel colors. The four lights when color-coded as Bright colors are Red, Yellow, Green, and Blue. The four lights when color-coded as Pastel colors are Pink, Ice Blue, White and Purple. Lights can be used to easily identify functions or staff. The CC-RS-4 is field programmable for a variety of functions and options. The dip switches allow the installer to choose our Doctor Follow Clinic formats, of first push of a button is a steady lamp, second push is a flashing lamp, and third push is off, or simple on/off either steady lamp or flashing lamp. If you need a combination of both to provide the Red level as an Emergency push for help and the other colors as Doctor Follow, this is also available with the flip of a switch. The Tech Works Intelligent Data Network Communication allows the status of these buttons and lights to be sent to Intelligent Master/Annunciator and other Substations.